Verizon Wireless has just launched a rugged mobile phone, Samsung Convoy 2, which is perfect for those people who want to live an adventurous life. This handsets has an ability to withstand against shock, dust, sand, solar radiation, salt fog, humidity, extreme temperatures. Big red added this rugged phone in its latest military-grade offering. The hardware specs of this handset are not as great as of other smart phones. 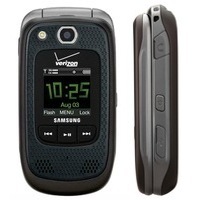 You can place an order of this mobile online at Verizon Wireless right now, this mobile phone will be yours for $80 (with a 2-year contract). If you’re not in a hurry then you can get it from the carrier’s outlets.